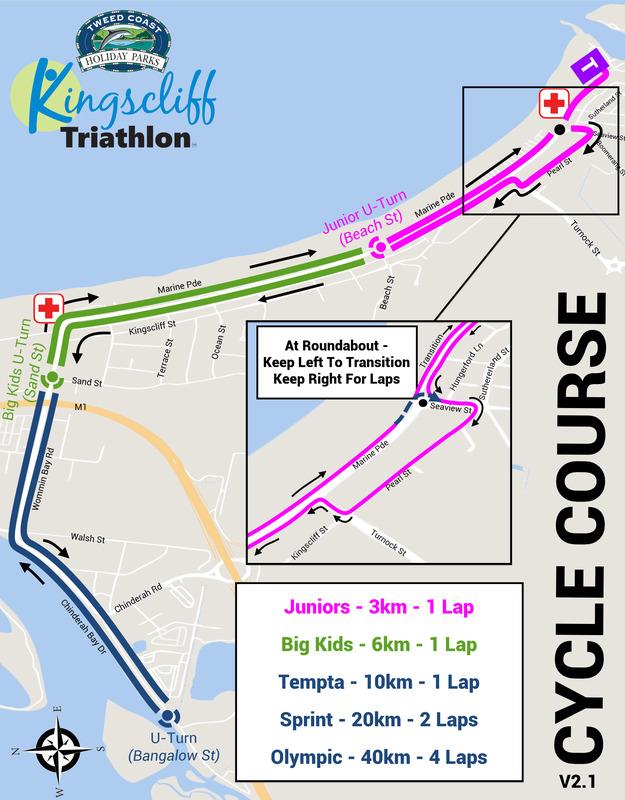 As we near the 20th edition of the Kingscliff Triathlon, we are continuing our journey with the local community and businesses to build a sustainable and valuable event. Join in for a fun, family-friendly triathlon at one of Australia's premier coastal sporting destinations in stunning Kingscliff! The swim is conducted in the enclosed Cudgen Creek with the tide, so swimmers will get a little assistance in the swim. In the event of poor weather conditions inhibiting competitors from completing the swim, we will conduct a beach sprint in place of the swim. Water safety is provided thanks to the Cudgen Headland SLSC. Juniors, Big Kids, Pinky, and Tempta, marshal at the Boat Ramp opposite Transition. Sprint marshal in Ed Parker Rotary Park next to the bridge. Olympic marshal on the other side of the bridge at Jack Julius Park. This is a 10-minute walk from transition – give yourself plenty of time. The cycle course follows the stunning coastline and the Tweed River providing a scenic setting to give riders that much needed boost! Athletes are responsible to know their turn points and to keep track of their laps as necessary. 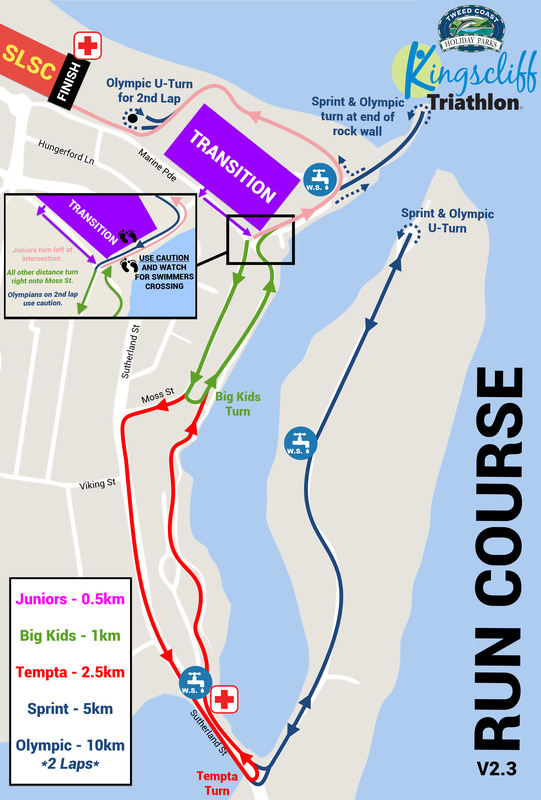 The run leg takes athletes along the picturesque foreshore following Cudgen Creek, over the Sutherland Street bridge and out to the end of the Sutherland Point. Keep an eye out for the whales! There are water stations in Rotary Park and one on Sutherland Point. Mobile first aid is available at the Sutherland Street Bridge. Athletes are responsible to know their turn points and to keep track of their laps as necessary. This is a fully supervised and coaching event with officials, lifeguards and volunteers supporting and coaching the kids every step of the way. Please note the age is calculated as at 31 December 2018. Designed for older kids and new triathletes, anyone over 13 years old is welcome to participate. The focus is all about having fun, getting active and feeling a great sense of accomplishment at the end. All participants must have either a current Triathlon Australia license at the date of the race or purchased a One Day Membership and the individual is responsible to ensure their insurance is up to date or they will be uninsured. Designed for anyone over 13 years old who is willing to give Tri a go. This is all for the first timers, with a focus on being a personal wellness challenge. The Sprint distance is perfect for having fun and developing your strength and fitness. Have a great hit out on a spectacular course without the stress of training for the full Olympic. 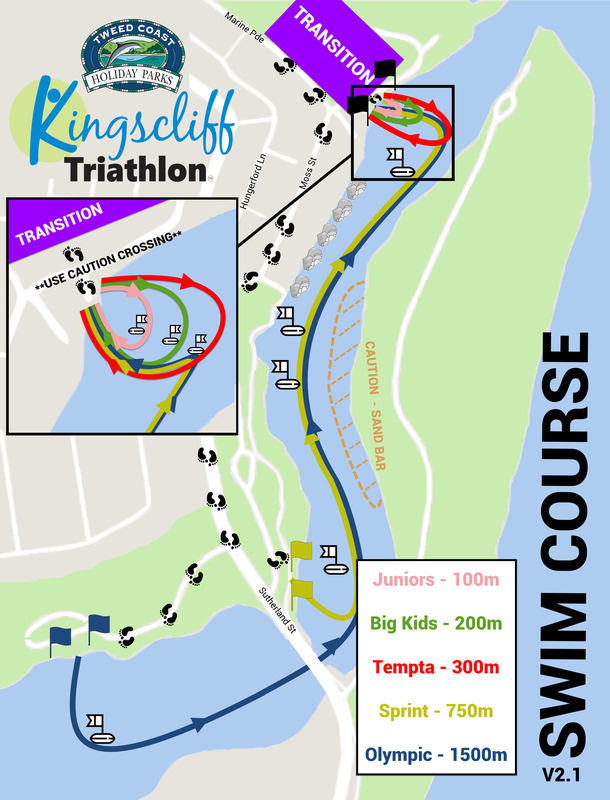 The classic Olympic (standard) distance triathlon on the stunning coastal course in Kingscliff for age groups, opens, athenas (over 75kg women) and clydesdales (over 100kg men). Parking for athletes and supporters is available at three primary locations. Athletes and supporters will be assisted in parking by traffic controllers. Parking is central to registration and transition. Do not park illegally or across driveways as this causes stress within the community. A reminder that the council will be onsite all day giving out fines after previous problems. Parking will not be available on the course, or in many of the streets adjacent to Marine Parade, such as Pearl Street or Seaview Street. It is strictly forbidden to park in the Kingscliff Shopping Village and Woolworths, and athlete’s vehicles will be towed. Wet suits are only permitted if the water is under 24 degrees. The water temperature will be checked one week out and then the day before the event. Bring together your squad and challenge your specialty. One athlete completes each leg of the triathlon, passing the timing chip to the next athlete in transition. Create your team with any combination of men or women. Teams can be of two or three members. Train together, race together. Grab three mates, and each challenge all three legs of a full triathlon. Each team will receive their individual time and cumulative team time. Create your team with any combination of men or women. Teams must be of three members. All individuals on the team must either have a current Triathlon Australia license at the date of the race or have purchased a One Day Membership. Each individual is responsible to ensure their insurance is up to date or they will be uninsured. There will be a bag store area for competitors under the Cudgen Surf Life Saving Club next to registration. Although the area will be staffed we take no responsibility for lost or damaged goods and do not recommend leaving valuables in your bag. The store room will be open from 5.00am Sunday and will close one hour after the last competitor is finished. Can I set up a team tent? All teams wishing to set up tents will be asked to do so in the designated areas. With the event operating in the center of town it is important for the safety and consideration of competitors, spectators and locals that team tents are only erected in permitted areas. Refer to the map or call the office for more information. What happens with wet and/or bad weather? We think you are going to get wet anyway, so if there is a little rain the event will continue. Presentations will move into the Surf Club. However, if it is cyclonic then the triathlon will be cancelled at the discretion of the Chief Official and Event Organiser. In the circumstance that the event is cancelled it will (A) be transferred to the following weekend or (B) postponed indefinitely. For more information contact the office. When will the water temperature be taken to determine if wet suits are permitted? A preliminary temperature will be taken the day before the race, with the official temperature taken the morning of the race. The final ruling on wet suits will be given the morning of the race. If the water temperature is too hot, wet suits cannot be worn as the suit may act as a heat incubator and cause heat exposure and other problems. My child would like to compete in the full triathlon. What can I do? If your child would like to race up in an age category, you must send an e-mail to Triathlon Australia from their coach and medical professional stating they are able to race the extended distance. Only once you have placed the sticker on your bike can you place it in the transition area and get it OUT of the transition area. The timing band must be placed on the left ankle. Once you finish the tri you are to return the timing chip to the collector at the end of the race. Collectors will be waiting for you at the finish line. It is a lot cheaper if you return the chip because if you forget you will have to pay $60. It is the responsibility of the competitor to read the race brief before you enter the water. This has all the information and rules to racing you need to know. There are no excuses if you don't follow regulations and are reprimanded by officials. Need to go? Where are the toilets? Permanent toilets are available in the park, Kingscliff Hotel, Kingscliff Surf Club, & Registration Hall and next to Faulks Park. A complete event base map will be available before race day. There will be penalties for not using the appropriate toilets. Qualified first aid will be onsite during the entirety of the event. St John Ambulance will be based at the Recovery Area and on Jenners Corner of the bike leg. First Aid Personnel will also be at Cudgen Bridge. If you need medical attention or see someone in trouble, please inform event staff immediately. Cudgen Surf Life Saving Club will be monitoring the swim and ensure safety amongst the participants. Police presence will be evident at the triathlon. The organisers are currently working with the police for permits and ensure maximum safety to residents, competitors and spectators. Cudgen Surf Life Saving Club will be manning the water to ensure the safety of all the participants in the swim. There will be 6 paddle boards in the water, 1 jetski and two IRB's in the water throughout the duration of the race. All participants must go around the buoys as indicated in the swim map and are expected to act in a responsible manner. If you are in trouble in the swim, raise one arm for a lifeguard's assistance. A swimmer cannot be towed during the race unless they are withdrawing from the race.